If you're in Austin, Texas next week, check out Kim Simpson at KUT's Views and Brews series. On Monday, 10/24, at 6 PM at Austin's Cactus Cafe, Early '70s Radio will be featured as part of KUT-FM's "Views and Brews" series. I'll be there to talk about the book, answer questions, and will perform a special acoustic medley of '70s radio hits, including "Rubber Duckie," "(You're) Having My Baby," "School's Out" and more. 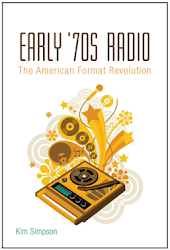 Kim also has some blog posts well worth reading over at www.early70sradio.com.